With deep pain we announce the passing of one of the most revered and beloved figures in Modzitz for tens of years, HaRav Avraham Shenker, zt"l, who passed away the first day of Sukkos. HaRav Shenker was the Head of Mosdos Modzitz [Institutions] for decades, the pillar of the Rebbe's Beis Medrash in Bnei Brak, and a father figure to hundreds of avreichim and bachurim [young men] for just as long. He authored the sefer Arisi Mori [chiddushei Torah on Torah, Moadim and Shas-Talmud], and was known in Modzitz for a special combination of Torah, Yira, Negina and Stature. HaRav Avraham was a son-in-law of the Imrei Shaul, and a vivid living link in the golden chain of Toras and Neginas Modzitz. His aron [coffin] will arrive Sunday afternoon, and the levaya [funeral] will start at 5:30 pm at the Rebbe Shlita's Beis Medrash in Bnei Brak - 20 Habakuk St. At 7:30 pm the levaya will continue at Shamgar in Yerushalayim, and then on to Har HaZeisim. I can only add to the official announcement above a few of my own impressions. "Reb Avrum," as we knew him, like his younger brother HaRav Ben Zion Shenker, n"y [may his light shine], was a Chassid to four [!] generations of Modzitzer Rebbes: the Imrei Shaul, the Imrei Aish, the Nachalas Dan, and today’s Rebbe Shlita. He always conducted himself with extreme humbleness, while maintaining utmost dignity. At almost every Tish, the Nachalas Dan ztvk"l and the Rebbe Shlita would honor him with the opening niggun [or two]. He was always prepared, and of course, the opening niggun often "set the mood" for the entire Tish. Yet it never went to his head. He was literally a "right-hand man" to four generations of Modzitzer Rebbes. An accomplished businessman, he was nevertheless well-versed in all aspects of Torah, and had fully absorbed the special avoda of Modzitz - that of Negina. Yehi zichro Baruch, may his memory be for a blessing for all of us! There was a Karliner Chassid, who lived in a small town, in a small, broken-down house. He didn't have much of anything, but he was joyous. Every year, when Sukkos came, he would wait until everyone else had built their sukkos, and he would go around and ask for whatever they had left over - a rotten board, a rusty nail. From these leftovers he would build his sukka, and all seven days he would sit in his sukka and sing with great joy. Across the field from the Chassid lived a rich man. He owned the local factory and employed most of the town. His house was large, and he didn't lack for any material thing. The rich man had everything he could imagine, but he wasn't happy. He was more than just not happy; he was really sad - downright miserable. The sukka that the rich man had built every year was a wonder - the size of a football field, with an oak table, candelabras, running water - everything he could imagine. But every year he sat in his sukka, and he heard the Karliner Chassid singing from across the field, and it drove him crazy - absolutely crazy. There's nothing that makes a sad person sadder than to meet a happy person, and there's nothing that makes a sad person happier then to meet another sad person. As Sukkos approached one year, the rich man had an idea. He went around to everyone in the town and told them, "When the Karliner Chassid comes around asking for a rotten board, a rusty nail - don't give it to him." What could anyone do? The rich man owned the town. When the Chassid came around to each person, he shrugged his shoulders, turned his palms up, and shook his head. Sorry, not even a rusty nail. The Chassid was about to give up - when suddenly, he got an idea. In those times, since many people in Russia and Poland couldn't afford marble or stone tombstones, the burial society used wooden planks instead. Written on each one were the Hebrew letters Peh-Nun, an abbreviation for "Po nitman," or "Here lies..."
The Chassid knew that there were many such planks in the cemetery, so he thought: "Certainly there won't be hundreds of people who die in this town over Sukkos. So who should care if I borrow a few planks, and return them after the holiday?" Meanwhile….the day before Sukkos arrived, the rich man looked across the field and smiled - there was no sukka outside the house of the Karliner Chassid. Sukkos came and the rich man sat in his sukka, at his oak table, with his candelabras and everything he could imagine. He made Kiddush in peace and blissful quiet. He began to eat his fish, in peace and blissful quiet. Then, from across the field, he hears…singing! He jumped up! How can it be? He looked outside and saw, across the field, a shabby sukka propped against the Karliner Chassid's house. He ran across the field and burst in on the Chassid, "Where did you get the wood for this Sukka?!" The Karliner Chassid received him with a glowing face, "Shalom Aleichem! Come in! Sit down!" Standing, the rich man repeated, "Where did you get this wood?" "I'll be glad to tell you, just come in and sit down," the Chassid told him. The rich man's eyes darted to the Chassid, the sukka, the door, and back to the Chassid. Frowning, he sat in the half-broken chair across from the Chassid. I said, 'One more pickup, huh? Mind if I ask who it is?'" "Now you wouldn't believe," the Karliner Chassid continued, leaning forward, staring right at the rich man, "but he said your name!" 'Well, if he's that sad, I guess I don't have to bother. Thanks for saving me the work!'" He paused, and than said, 'You know, I'm not scheduled to be back here until after the festival. In the burial society, they have the wooden stakes they put in a new grave before [or instead] they put up the headstone, the wooden stakes that say 'Here lies' at the top. I'm not planning to be back here, so you can use those to build your sukka.'" "And that's exactly what I did," the Chassid said. "In fact, if you look up there, you can see that on each board, it says 'Here lies.'" And with that, the Karliner Chassid burst into a joyous song. But… the Chassid's words pierced the rich man's heart like arrows. He began to cry from the depths of his heart. Finally, he asked the Chassid, "What can I do? I cannot remove the sadness from my heart. Tell me, I have everything, but no joy. And you, who have nothing - from where do you get all this joy?" The Chassid responded: "If you want to be joyous, you must go to the holy Karliner Rebbe. There you can learn what true simcha really is." The rich man went to Karlin, and although he had been full of anger and sadness, became one of the greatest Karliner Chassidim. He just needed someone to ignite his spark. Reb Shlomo notes that he heard that there were even several letters of correspondence between the Karliner Rebbe and this man. Here's the Video of VeHaKohanim! I really wanted to post Shlomo's "VeHaKohanim" before Yom Kippur, as the words are from the Yom Kippur "Avoda" [service of the Kohen Gadol on Yom Kippur] which we recite at Musaf [the additonal service] of YK, but time was too tight. In any case, a few comments: I refer to it as an Alt-Neu [old-new] niggun, because the first part is very similar to part of an old Ropshitzer waltz, that Shlomo Katz could very well have heard from R. Shlomo Carlebach, or elsewhere. The second part, "Hayu korim" [they bowed] is the newer part and quite original. This is the title song of Shlomo's CD, about a year old now. I post it now as we are going from the post-Yom Kippur joy of atonement for our sins, to the full Joy and Simcha of Chag HaSukkos. In addition, those of us in Eretz Yisrael will soon enjoy the mass Birkas Kohanim [priestly blessing] at the Kosel HaMa'aravi, the Western Wall, this Sunday...Meanwhile, enjoy the video above! Tonight is the 6th of Tishrei, and the 196th yahrzeit of Rebbe Aryeh Leib, known as the Shpoler Zeide ["grandfather"]. Rebbe Aryeh Leib was a disciple of Rebbe Pinchas of Koretz. For a long time Rebbe Aryeh Leib was a nistar, a hidden tzaddik, until he was "forced" to reveal himself. The Shpoler Zeide was a folk Rebbe: singing, dancing, joyful. He consoled, encouraged, counseled, gave remedies, made peace between man and wife and between parents and children, defended the weak, threatened the strong with spiritual punishment, and stood up in defense of the abused Jewish lessees. "He was a father to many, many Rebbes, each one blessed in his own right…a father of perceptions, grimaces, manners, middos [good character] and madreigos [spiritual levels], father of banter and amazing stories…father of the trait of self-amazement which characterized many Rebbes…Rebbe Leib of Shpole, this Zeide, is the father to a multitude of Jews, that is, good Jews and Rebbes.” [from Morei HaChassidus, by Eliezer Steinman]. There’s lot’s more at that post, including highlights about his niggunim. The following story was adapted by Yrachmiel Tilles of Ascent from the rendition at L’Chaim Weekly. I have added to it very slightly, from the original Hebrew rendition. When Rebbe Aryeh Leib had been Rebbe for three years in Shpola, there was terrible famine in the area, and the Jews suffered more than anyone else. The tzaddik, whose love for the poor, the needy and the widowed was unbounded, felt compelled to provide for the thousands affected by the disaster. He could neither eat nor sleep, and his heartache was so great that for weeks on end he couldn't bring himself to taste anything more than bread and tea. As the famine spread to the furthest provinces of Russia, Rebbes from other starving communities in the area wrote to Shpola, begging the Zeide to raise a storm in the Heavens, and beg that the deadly decree be rescinded. For who, if not he, a tzaddik and known to work wonders, could accomplish this? Rebbe Aryeh Leib, for his part, wrote to ten of the greatest tzaddikim of the day: the Rebbe Reb Zusia of Anipoli, Rebbe Yaakov Shimshon of Shipitovka, Rebbe Ze'ev Wolf of Zhitomir, Rebbe Leib HaMochiach of Polnoye, Reb Leib Kohen of Berditchev, Rebbe Yisrael and Rebbe Azriel of Politzk, Rebbe Gedalia of Linitz, Rebbe Mordechai of Neschiz, and Rebbe Nota of Razdil. He requested that they come to Shpola immediately. They all complied and soon arrived. After they were seated at the long table of the Shpoler Zeide, they heard his awesome words: "Honored rabbis, my masters, I am summoning the Almighty to a din Torah, a lawsuit in rabbinical court, and you are to serve as the judges. It is true that, according to the law of the Torah, the plaintiff must take his suit to the place where the defendant is, but since in this unique case, 'there is no place devoid of His presence,' and since, more particularly, 'wherever ten are assembled the Divine Presence rests,' we will hold the court case here." The holy minyan of Chassidic Rebbes accepted. They then joined in prayer, their fervent supplications battering the Gates of Heaven. The Shpoler Zeide then instructed his aide to announce: "By the order of those gathered here, I hereby proclaim that Aryeh Leib, the son of Rachel, summons the Almighty to a lawsuit which will be duly conducted in this Beis Din [courtroom] in three days." The holy Rebbes spent the next three days together in fasting and prayer; no one was permitted to interrupt their devotions. On the fourth day, after they had concluded the morning prayers and were still wrapped in their tallis and adorned by their tefillin, the Shpoler Zeide solemnly signaled his aide to announce that the court case was about to begin. "In the name of all the women and children of the Jews of Russia," the tzaddik declared, "I hereby state my claim against the Defendant. Why does the Creator of the Universe not provide them with food, thereby preventing their death (G-d forbid) of hunger? Doesn't the Torah itself say, 'For unto Me are the Children of Israel bondsmen; they are My bondsmen'? Do we not have His promise, recorded by the Prophet Yechezkel, that even if His children should someday desire to go in the ways of the nations of the world, that this will never happen? One is forced to draw the conclusion that the Children of Israel are the Almighty's servants for all eternity. "In that case, they should, at least, be in the category of Jewish servants. Jewish law teaches that a master is required to provide for the wife and children of his servant. Can the Almighty violate his own Torah so blatantly? "Firstly, where is it written that if a servant is lazy and doesn't work properly, his wife and children may be deprived of their sustenance? "Secondly, if these servants are slack in their performance, their Master can fault no one but Himself. For who else gave each servant an evil inclination whose whole job and purpose it is to drive them to abandon their loyalty and to destroy their desire to serve? Why, I can swear that if this evil inclination, which the Master Himself created, would cease to exist, they would become the most perfect servants possible!" "This court finds in favor of Rebbe Aryeh Leib, the son of Rachel. The Almighty is accordingly required, by whatever means at His disposal (and the whole world is His) to provide for the women and children of His People. And may the Heavenly Court above agree and support the verdict of this court in the World Below." The court pronounced its verdict three times. The Shpoler Zeide then asked to have whiskey and refreshments served. The tzaddikim toasted L'Chaim and ate together in a joyous mood before departing for home. Five days after the momentous verdict had been reached, the government announced a shipment of thousands of tons of grain. Immediately, the grain prices fell and before long, there were ample fresh supplies of food at reasonable prices. And during the entire following year, bread was bountiful and affordable for all! Zechuso Yagein Aleinu v'al Kol Yisrael - May the Zeide's merits protect us all! The following is a combination of two versions of the same story, about Rav Avraham Yitzchak HaKohen Kook. One is by Chanan Morrison at his website on Rav Kook [and also found on Arutz 7’s site]; the other is from a relatively new publication called The Shiur Times. I have taken the liberty to weave the two together to form a richer, more complete version, with very light editing. The moments when the shofar is sounded on Rosh Hashana are perhaps the most emotionally charged and spiritually significant island in time of the entire High Holiday period. The shofar has many profound messages; its most familiar message is, of course, to remind us of the Akeidas Yitzchak [binding of Isaac] and the ram that took the place of Yitzchak as sacrificial offering. Rav Moshe Tzvi Neriah, one of the close students of Rav Avraham Yitzchak HaKohen Kook, edited a beautiful work called Moadei HaRe'iya, which is a collection of essays and stories, from the life and work of Rav Kook, specifically regarding each of the Jewish Holidays. There is a particularly powerful story, which occurred one Rosh Hashana in the late 1920s, that really sums up the multi-tiered inspirational messages contained within the shofar's sounds. A group of workers was pressured to complete a building in one of the neighborhoods of Jerusalem and they continued working during the Rosh Hashana holiday. When the neighbors realized what was happening, they immediately sent word to Rabbi Avraham Yitzchak Kook. Obviously saddened by this news, Rav Kook decided upon a strategy as to how he must address this situation. The next morning, Rav Kook sent one of his gabbaim (ritual assistants) to visit the workers, and to bring a shofar with him. Rav Kook gave the gabbai careful instructions not to speak any harsh words, rather to merely go to the construction site, and to simply sound the shofar. The gabbai arrived at the construction site, with a shofar in his hand. When he approached the workers, they were surprised to see him. After a New Year's greeting, he announced that Rav Kook had sent him to blow the shofar for them. He politely asked them to cease their work and listen. He began to blow. The words from the Rav and the sound of the shofar achieved their goal. Every note touched the delicate chords of the soul and awakened the Jewish spark in the hearts of the young workers. They dropped their tools and gathered around the man blowing the shofar. Some began to cry. The ancient sound of the shofar echoing in the unfinished rooms of the building transported them back to their fathers' houses, to images of grandfather, the village and the shul, to a world of Jews standing in prayer. Questions began to pour out, one after another. What has happened to us? Where are we? What have we come to? The young men stood around the gabbai, engrossed and confused in their thoughts. When the blowing was completed, there was no need for words. They all decided to cease their work. Some requested to return with the gabbai. They hurriedly changed clothes and accompanied him to join the holiday prayers in Rav Kook's beis midrash (house of study). 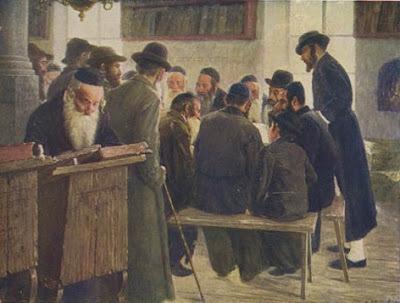 When the gabbai returned to the synagogue, he asked Rav Kook how come he did not simply go and address these workers himself; surely a visit from the esteemed Chief Rabbi would have encouraged all of the laborers to join the many who had decided to return to the synagogue with the gabbai. Rav Kook's answer is perhaps the most powerful point of this entire story. Rav Kook explained that had he arrived at the site, surely he would have caused great embarrassment, even shame to the many workers! Although the public desecration of this holiest of days certainly pained him deeply, the pain he felt when the Torah's honor was tarnished in such a public manner enveloped his entire being; but what pained him most was to know that there were Jews who might go through an entire Roth Hashana and not hear the beautiful sweet sounds of the shofar. In an open letter written in those days, Rav Kook wrote: "A friendly word is effective; a brotherly expression of respect will bring others close. Let us not abandon the good and straight path that is illuminated with love and goodwill, peace and friendship. ...We must destroy the wall that divides brothers, and speak heart to heart, soul to soul. Then our words are certain to be heard." 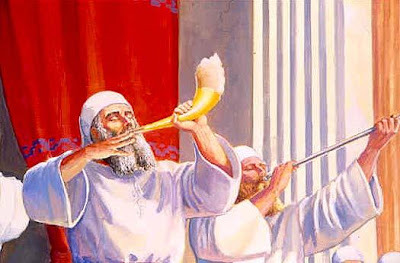 The shofar's sweet sounds remind us of the beauty that is a Jewish way of life, the enrichment, fulfillment and contentment that Torah can bring to each of our lives. The shofar's sounds reach that pure spark within each of us, and softly remind us that we can indeed leave behind all those issues and confusing circumstances that cloud our vision our vision of ourselves, our vision of the world, and our vision of each other. When we hear the shofar this Rosh Hashana, may it inspire within us a new found desire for true freedom; freedom to leave behind the many challenging events of this past year, freedom to leave behind whatever lingering grudges and preconceived notions we may hold toward family, friends, and neighbors. May the sounds of the shofar this Rosh Hashana, soon be echoed with the sounds of Great Shofar of Freedom, that we have been longing for, for so, so long,..
And with that, I wish you all a Shana Tova U’mesuka, a Good and Sweet New Year, full of Hashem’s blessings, full of the joy and elevation of authentic Negina and the warmth of Torah-true Judaism as we try to convey here. Tonight and tomorrow, the 27th of Elul, is the 152nd yahrzeit of the Sar Shalom, the first Belzer Rebbe. Rebbe Shalom of Belz [1779-1855] became the main Rebbe of Galician Jewry, and had tens of thousands of Chassidim. His teachings are collected in Dover Shalom. Read more on him in last year’s posts: A Shul is Built in Belz, and Gems from the Sar Shalom. As we [Ashkenaz Jews] have just began to say Selichos, this story, from our good friend Yrachmiel of Ascent in Tzfas, is most appropriate. On the first night of Selichos over one hundred years ago, instead of going to the large Shul to signal the beginning of the prayers, Rebbe Shalom of Belz, ordered his attendant to harness the horses. He said they would be going into the woods. The astonished attendant wanted to remind the Rebbe that thousands of Chassidim were waiting in the Shul, but he knew better than to ask questions and went out to prepare the wagon. After a half-hour drive the Rebbe signaled him to stop. They alighted and walked down a narrow path till they saw a small hut in the distance. The Rebbe signaled the attendant to wait for him, and then tiptoed alone up to the window and peeked in. An old Jewish man was sitting alone at a table. On the table was a bottle of vodka and two small cups, one in front of him and the other before the empty seat opposite him. Through the window the Rebbe couldn’t hear what the old man was saying, but he saw him raise his cup in a toast, drink it, and then drink the second cup as well. This he repeated two more times, after which the Rebbe tiptoed back to the attendant. They walked quickly to the wagon and the Rebbe motioned him to drive back to Belz. Meanwhile the Chassidim had been waiting for over an hour and were becoming worried. But when the doors of the Synagogue opened and the Rebbe entered, the congregation fell silent. All eyes followed him to his place at the front of the Shul, and the room burst into prayer as they began Selichos. When the prayer ended the Rebbe turned to his secretary and said, "There is an old man that came in after everyone and I’m sure he will finish after everyone also. He’s the one I saw in the house in the woods. Please wait for him to finish. Tell him I want him to come to my study and speak to him alone." Half an hour later the simple Jew was standing in fear and trepidation before the Holy Rebbe. "Sit down, Zelig," said the Rebbe, "I want you to tell me what you did in your house before you came here tonight. What were those two cups of vodka for and that strange L'Chaim you made?" "The Rebbe knows that?" he exclaimed, his eyes bulging out in amazement. Then he started to shake. "How does the Rebbe know?" "I sensed that something important was going to happen," the Rebbe answered, "so I drove to the woods and peeked in your window. But I want to understand what you were doing." "The Rebbe peeked in my window! How could it be? I am a nothing!" Now the poor Chassid was really confused. He was silent for a moment. Then, realizing that there was no alternative, he sank down onto a chair and began to explain. "But the cow got worse. 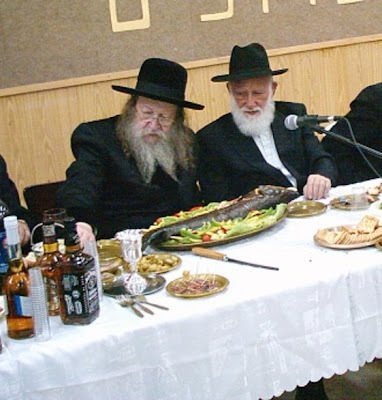 So I said 'Listen G-d, if You don’t heal that cow I’m not going to the shul any more!' I figured that if G-d doesn’t care about me - I mean, it’s nothing for Him to heal one old cow - so why should I care about His place? "But the cow died and so I, I got mad and … and… I stopped going to synagogue. Then my goat got sick! I said to G-d, 'What! You haven’t had enough? Do you think I’m bluffing? Listen, if this goat dies I’m not putting on tefillin any more!' So the goat died and I stopped putting on tefillin. "Next, my chickens got ill and I told G-d that if they die I’m not going to recite Kiddush or keep Shabbos. Well, a week later I was without chickens and G-d was without my Shabbos. "I held out for over a week until suddenly I realized that the time for Selichos was approaching. I thought to myself, 'What, Zelig, you aren’t going to go say Selichos with the Rebbe? What, are you crazy?' But on the other hand I was angry at G-d and vowed I wasn’t going to the shul. "But then I remembered that once I had an argument with Shmerel the butcher. For about a month we didn’t even say hello. Then one night he came to my house with a bottle of vodka and said, 'Let’s forget the past and be friends, enough enemies we have among the goyim; why be enemies.' So we made three L'Chaims, shook hands and even danced around a little together and we were friends again. "So I figured I would do the same thing with G-d. I invited Him to sit opposite me, poured us two cups and said, 'Listen, G-d, you forget my faults and I’ll forget yours. All right? A deal?' L'Chaim! "So I drank my cup and understood that since G-d doesn’t drink, He probably wanted me to drink His. And after we did it twice more I stood up and we danced together! Then I felt better and came to Selichos." The Rebbe looked deeply into Zelig’s innocent eyes. In a serious tone, he said, "Listen to me, Zelig. Before we began Selichos I saw that in heaven there was a terrible decree on our holy congregation, because the Chassidim were saying the words in the prayer book but they weren’t really praying seriously to G-d. Of course, there are a lot of distractions and other excuses; nevertheless this terrible decree was looming. "But you, Zelig, you talked to G-d like He is your friend. Zelig, your sincerity saved the entire congregation!" Zechuso yagein Aleinu - May the Sar Shalom's merits protect us! 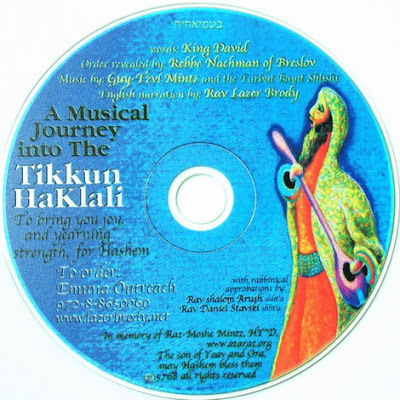 This fantastic CD features the Tikkun HaKlali set to music, composed and performed by one of Israel's and Breslov's best ballad singers, Guy Tzvi Mintz of Bat Ayin, and the Bayit Shlishi [Third Temple] Ensemble. The original Hebrew edition took Israel by storm. This edition - produced in cooperation with Emuna Outreach - features Guy Tzvi's same exquisite performance of the Tikkun HaKlali, with an English introduction by Rav Lazer Brody. In addition to the Tikkun HaKlali, this CD includes "Shirat HaYam", "Mizmor L'Todah," and "Aleinu". Rav Lazer continues: "To show you just how sweet Guy Tzvi Mintz's musical journey into the Tikkun HaKlali is, here's a sample - Guy Tzvi singing Psalm 90 , one of the ten Psalms of the Tikkun HaKlali." Yitz adds: Guy Tzvi Mintz is one of the up-and-coming Israeli musicians, or rather, baalei Negina. Those who understand Hebrew can see an eight minute video interview and songs here. His album "Niggun Adin" [A Gentle Tune"] is fantastic - hear samples of it here. He has a few other CDs out, plus a book in Hebrew about Kosher Negina. "Rebbe Nachman made a promise that no other Tzaddik in the whole of Jewish history has ever made. Taking two of his closest followers as witnesses, he said: "When my days are ended and I leave this world, I will intercede for anyone who comes to my grave, recites the Ten Psalms of the Tikkun HaKlali [General Remedy] - and gives some charity. No matter how serious his sins and transgressions, I will do everything in my power to save him and cleanse him..."
So for those Breslovers preparing to go soon to Uman for Rosh Hashana, this disk can be a very useful tool, thanks to Rav Lazer and Guy Tzvi Mintz! from our post, two years ago: Tonight and tomorrow, the 22nd of Elul, is the yahrzeit of the Heiliger Pele Yoeitz, Rebbe Mordechai Dov Ber of Hornosteipel. 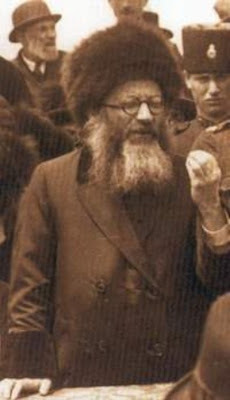 A direct descendant of the Rebbe Reb Zusia of Anipoli, he was also the grandson and successor of the Cherkassy Rebbe, a son-in-law of Rebbe Chaim of Sanz, and a tremendous Talmid Chacham [Torah scholar] and Chassidic Rebbe in his own right. 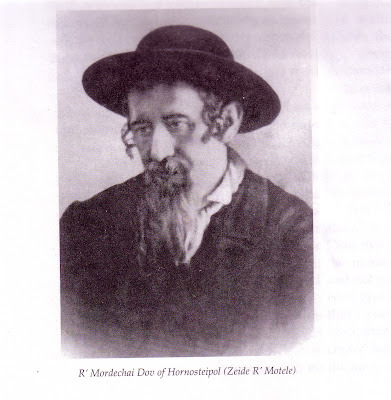 Rebbe Mordechai Dov was descended from many Chassidic greats [besides the Rebbe Reb Zusia]. These included the Baal Shem Tov, Rebbe Nachum of Chernobyl, Rebbe Schneur Zalman of Liadi [Chabad-Lubavitch], and Rebbe Aharon HaGadol of Karlin. But he was not one to rest on his laurels: he left us some great Halachic works, Emek Shaila [responsa], Turei Zahav on the Halachos of Ribis [interest]. He also expounded Chassidic teachings on Torah which are found in the Pele Yoeitz, for which he is known; Emek Chochma [which appears together with his grandfather's (Rebbe Yaakov Yisrael of Cherkasse) sefer, Emek Tefilla as Shoshanas HaAmakim. This story is from Rabbi Dr. Avraham J. Twerski’s wonderful book, The Zeide Reb Motele. The Czarist government set strict limitations on the travels of tzaddikim. The Zeide R. Motele was not permitted to leave Hornosteipel. When he married off his son, R. Baruch David, in Homel, he removed his traditional garb and dressed like a businessman in the hope that he would not be detected. However, due to the throng of Chassidim who gathered for the wedding, the word got out that Zeide R. Motele was there, and he had to flee. Immediately after the chupa, he boarded a carriage to return to Hornosteipel. ''And so it was. Some of the group did teshuva and were successful. Those who remained bandits were captured and led away in chains before R. Zusia's house. Zechuso yagein aleinu v'al kol Yisrael - May the Pele Yoeitz's merits protect us all!